I looked up how to make pudding “en flambe” and decided to skip that and go for a French Onion soup instead, mostly because I wasn’t too keen on the idea that I could possibly burn down my house. When Jen and Nate arrived, we laid all of our ingredients out on the counter and began to cook. We had one pot going for the beef ragout, another pot for the soup, and another for the pasta that would accompany the ragout. Ramekins in the oven housed the cheese souffle, and all three of us were meticulously checking and stirring to make sure nothing burnt and everything came out perfect. Around an hour and 15 minutes and several dishes later, our dinner was prepared and I learned that Jen has mad chopping skills and a superhuman immunity to onions, Nate is very very good at washing dishes and making sure nothing burns or overcooks and I can successfully make a cheese souffle. Naturally, we had to set the table thematically. Jen brought some roses, I grabbed my Chip coffee cup (yes, that exists) and some books from my room. Dinner was bomb. We were extremely proud of ourselves. The soup was full of flavor and not too thin. The cheese souffle reminded me of a cheese omelette; I think souffles usually turn out a bit more fluffed but I was perfectly content with my first attempt. 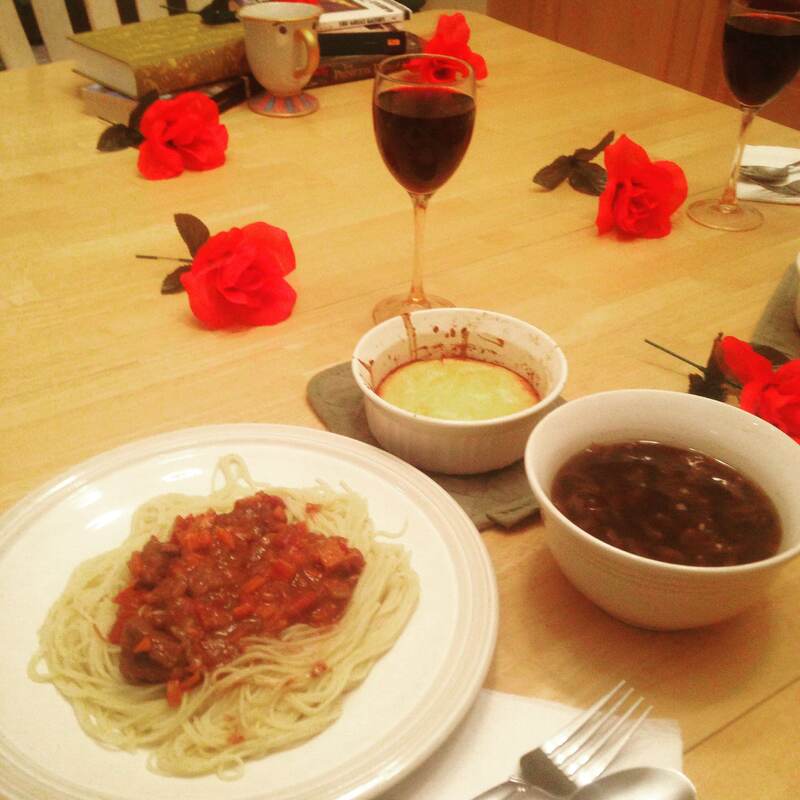 The beef ragout was a wonderful mix of veggies and red wine and meat. There was another recipe that I had found that called for slow-cooking the beef and I think the next time I try to cook this meal, I’ll go for the slow-cooker. And of course, we had the dessert. 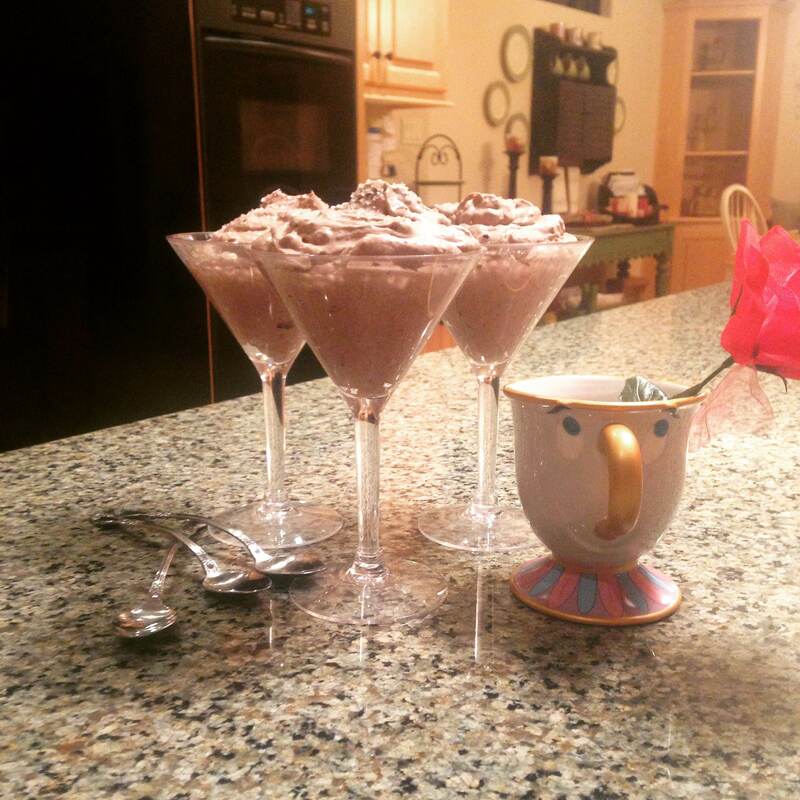 Did you really think we would have a 3-course Disney-inspired meal without a dessert? Lovely Readers, I present to you: The Grey Stuff! 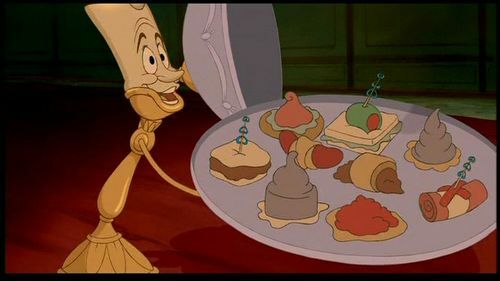 In Beauty and the Beast, the grey stuff is actually presented to Belle at the beginning of the song, served upon (of all things) what looks like a cracker. Mix entire contents of vanilla pudding mix and milk in a large bowl with a whisk. Set in fridge to chill 5 – 10 minutes. Place Oreos in food processor and blend until they are fine crumbs (no large chunks). If you don’t have a food processor, you can place them into a gallon-size freezer bag and smash using a rolling-pin. This will take a bit of time, since you’ll want to get rid of all large pieces. Take the pudding from the fridge and mix in the crushed Oreos. The mixture will be dark gray/black. Now, fold in the tub of whipped topping. It now is a lighter color but not quite gray. Finally, mix in the chocolate pudding mix and stir well. You should now have “the grey stuff”! Place back in fridge to chill for at least one hour before serving. It is seriously that easy. For our version, we used two cartons of whipping cream and made it light and fluffy with a blender. I think it made our version even sweeter. The grey stuff is definitely a dessert that I will be making over and over again. Jen, Nate and I decided to do a themed dinner at least once a month. (We are busy people after all.) I would love to hear any suggestions that you think would be fun to try!